Finding the right service provider to organise and handle your office removal is easier said than done, as there are quite a few removal companies out there all claiming to have the perfect service for you and your business. However, when it comes to professional grade, highly efficient office removals, that are worth your time and money, then by all means get in touch with Office Removals Finsbury Park and become part of a better moving experience. The company has the required industry experience, technical capacity and manpower to handle all types of office removals, regardless of their scale or complexity. We have been an active part of the industry for long enough to know what customers expect of a genuinely good office removal service that is actually worth it. If you are looking for professionalism, punctuality, reliability and high level of work efficiency then we indeed have just what you need. Our qualified relocation specialists will visit you in advance of the actual move and discuss with you the most efficient and cost effective way to organise and carry out the removal. This is done in order to save you and your staff from costly delays and disruption to daily duties. This would allow us to complete the removal within the allocated amount of time, which translates to less downtime and no penalty fees for failing to vacate the current property timely. We can easily fit into any moving budget due to the fact that we don’t work with fixed prices. We calculate our relocation rates by taking into account the exclusive parameters of each Finsbury Park, N4, office or home removals for which we are hired. You can lower furthermore the costs of your move by combining several of our man and van services into a personalised bundle as we will make you a special and lucrative discount. Our diligent, and well organised mover teams will arrive at your address at the specified time and commence work immediately. The movers will quickly distribute tasks amongst them and pack, secure and load your office contents and equipment in such way as to make handling and transportation more efficient, yet safer. Special care and consideration will be taken when handling high value items or expensive equipment and machinery. 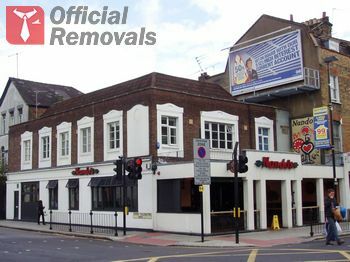 Office Removals Finsbury Park works with specially trained, professional movers, who possess the necessary skills and expertise, which means no risk of damage or misplacement of items during handling or transportation. We provide the most competitive and fair quotes, on top of already reasonable service prices. We are based in the north London district of Finsbury Park, N4. The area is situated on the borders which separate the boroughs of Hackney, Islington and Harringey. The latest census shows that the district is home to a population of about 14.500. Finsbury Park is linked to the other parts of the city by its own station which was opened in 1861. It provides transportation services to over 30 million passengers on a yearly basis.